The holidays are just around the corner, and this year my sister-in-law volunteered to have the meal at her house, so this means I have some free time leading up the day, in which previous years I have not. (I am on pie duty, which I will take any day over making the turkey.) Since there will be family in from out of town and friends in and out of my house, I like to make sure there is something to eat each day for breakfast that everyone will enjoy. 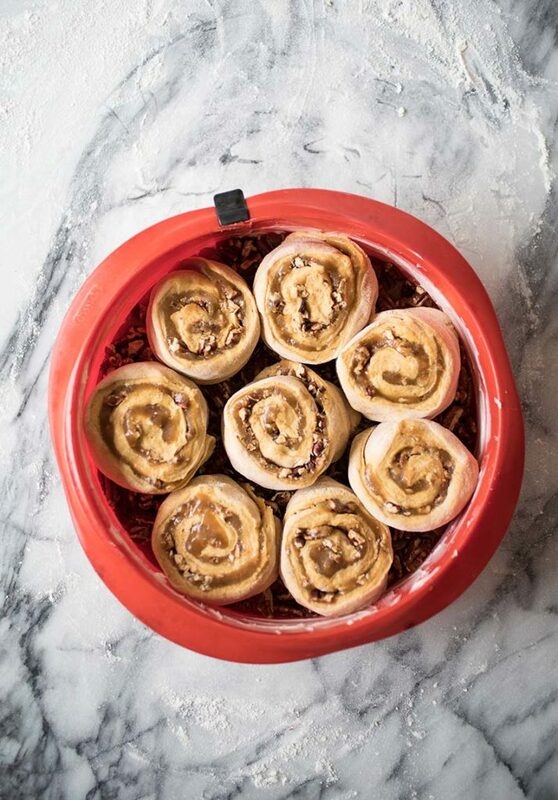 These Pumpkin Sticky Nut Rolls fit the bill perfectly, and the fact that I can assemble them the night before and let them rise in the fridge overnight is a huge bonus. Cover the container and allow the dough to rest on the counter for 2 hours. Once it has risen refrigerate for at least 4 hours before baking or it is too difficult to handle. It can be stored in the refrigerator for up to 5 days. To bake: Mix together the melted butter, brown sugar, honey, cinnamon, nutmeg, salt, and pepper. Grease the sides of a 9×3-inch springform cake pan with butter. (If your pan doesn’t have a great seal, then line the bottom and sides of the pan with a piece of parchment paper and grease the parchment.) Spread half the butter-sugar mixture evenly over the bottom of the pan. Scatter half of the pecans over the butter-sugar mixture and set aside. Dust the surface of the refrigerated dough with flour and cut off a 1 1/2 pound piece. Dust the piece with more flour and quickly shape it into a ball by stretching the surface of the dough around to the bottom, rotating the ball a quarter turn as you go. Using a rolling pin, roll the dough out into a 1/8-inch-thick rectangle, about 14×8 inches. As you roll out the dough, use enough flour to prevent it from sticking to the work surface, but not so much as to make the dough dry. Spread the remaining butter-sugar mixture evenly over the rolled-out dough, chop the remaining nuts, and sprinkle them over the top. Starting with the long side, roll the dough into a log and pinch the seam shut. With a kitchen scissors or a very sharp serrated knife or kitchen shears, cut the log into 8 equal pieces. Arrange over the nuts in the pan, so that the swirled cut edge is facing down. Cover loosely with plastic wrap and allow to rest at room temperature for 1 hour. Preheat the oven to 350°F, with a rack placed in the center of the oven. 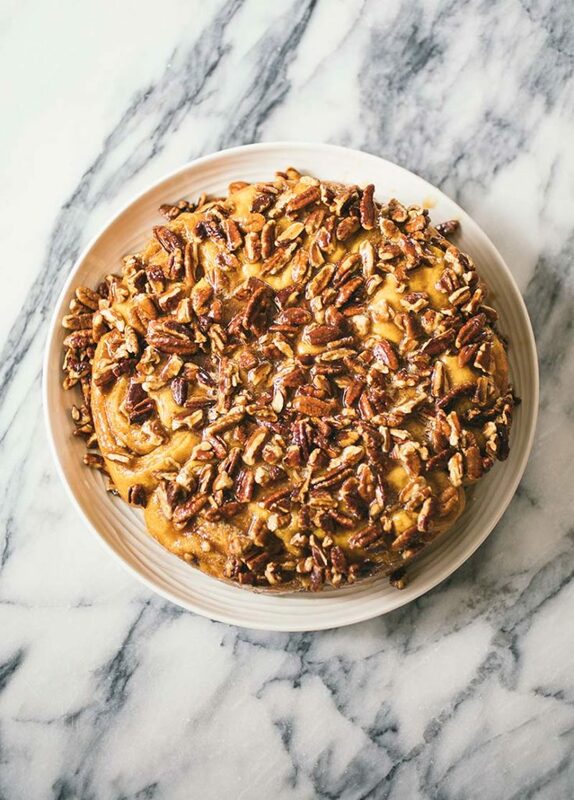 Place the pan on a rimmed baking sheet, in case the caramel bubbles over, and bake for about 40 minutes, or until golden brown and well set in the center. While still hot, run a knife around the edge of the pan to release the rolls and invert immediately onto a serving dish. If you let them set too long, they will stick to the pan and be difficult to turn out. Allow to cool for about 15 minutes before serving. 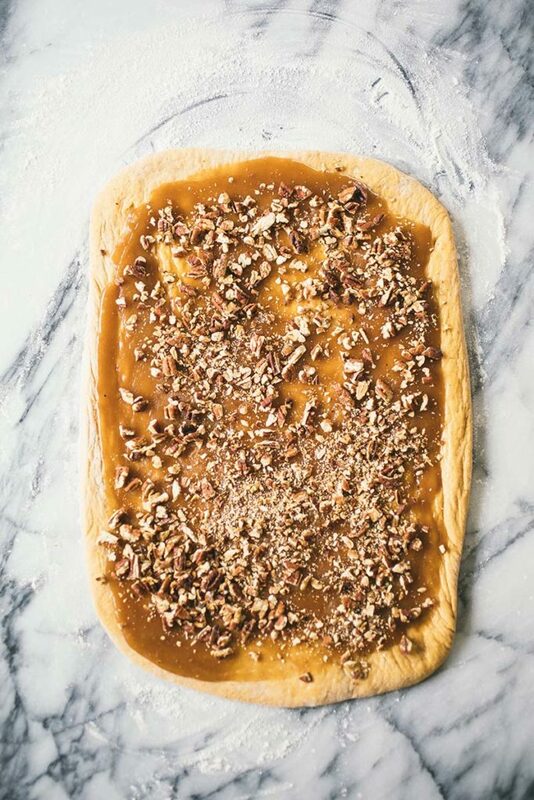 Refrigerator Rise: Set your caramel rolls up the night before, so you bake them first thing in the morning: Prepare the rolls, cover loosely with plastic, and refrigerate for up to 18 hours. When ready to bake, preheat the oven and then slide the rolls into the oven. They will take longer to bake, since they will be well chilled. They’ve had a long, slow rise in the refrigerator, so you don’t need to let them rise more before baking. This recipe makes a big batch of gooey, sticky rolls, because if you don't make a bunch of them, you end up regretting it! Cover the container and allow the dough to rest on the counter for 2 hours. Once it has risen, refrigerate for at least 4 hours before baking or it is too difficult to handle. It can be stored in the refrigerator for up to 5 days. To bake: Mix together the melted butter, brown sugar, honey, cinnamon, nutmeg, salt, and pepper. Grease the sides of a 9x3-inch springform cake pan with butter. (If your pan doesn't have a great seal, then line the bottom and sides of the pan with a piece of parchment paper and grease the parchment.) Spread half the butter-sugar mixture evenly over the bottom of the pan. Scatter half of the pecans over the butter-sugar mixture and set aside. Dust the surface of the refrigerated dough with flour and cut off a 1½ pound piece. (Remaining dough can be kept covered in the refrigerator for up to 5 days.) Dust the piece with more flour and quickly shape it into a ball by stretching the surface of the dough around to the bottom, rotating the ball a quarter turn as you go. 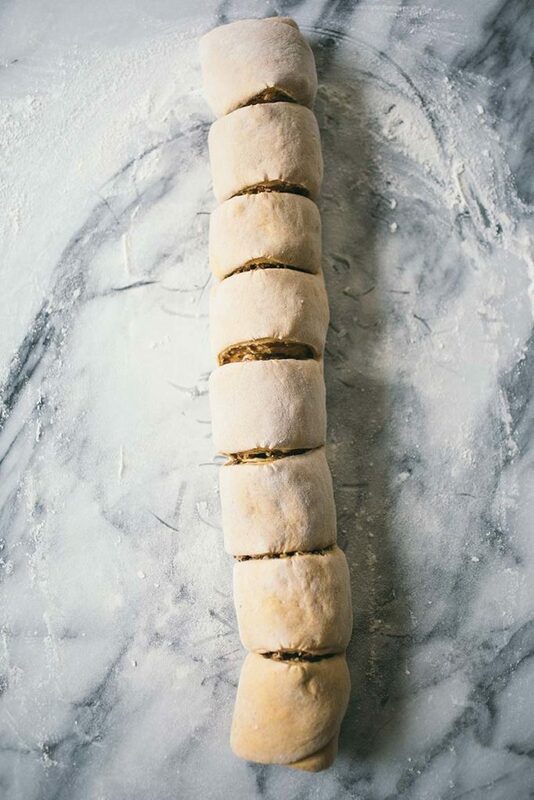 Using a rolling pin, roll the dough out into a ⅛-inch-thick rectangle, about 14x8-inches. As you roll out the dough, use enough flour to prevent it from sticking to the work surface, but not so much as to make the dough dry. Spread the remaining butter-sugar mixture evenly over the rolled-out dough, chop the remaining nuts, and sprinkle them over the top. 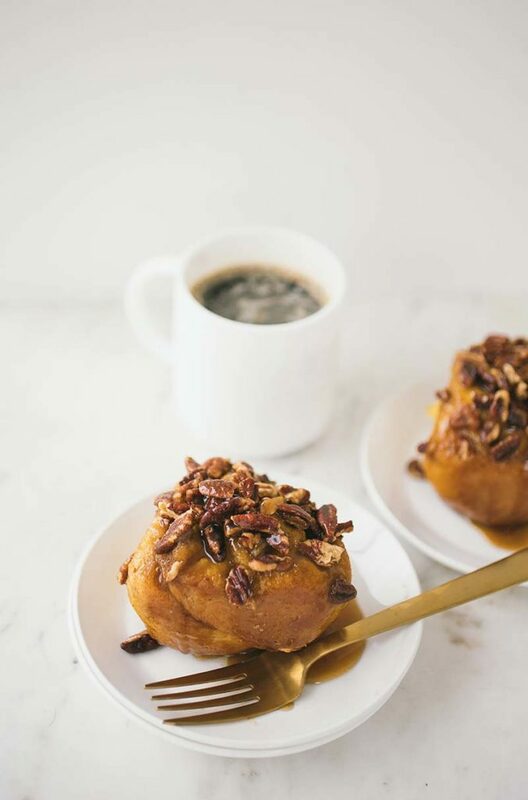 Refrigerator Rise: Set your caramel rolls up the night before, so you bake them first thing in the morning: Prepare the rolls, cover loosely with plastic, and refrigerate for up to 18 hours. When ready to bake, preheat the oven and then slide the rolls into the oven. They will take longer to bake, since they will be well chilled. They've had a long, slow rise in the refrigerator, so you don't need to let them rise more before baking. We’re giving away one (1) copy of the new Holiday and Celebration Bread in Five Minutes a Day cookbook to three (3) randomly chosen winners. Enter using the Rafflecopter widget below. Good luck! About 3 times per month. During the winter months I try to bake with yeast at least once a week. Occasionally. More so around the holidays. I love baking with yeast! I do so about once a week. I would say about once a week. Bake bread once a week during the colder months. Red Star makes baking fun! Love Red Star yeast! I bake yeast dough at least once a week ever since I removed processed sugar from my life- I make sweet breads using honey , maple syrup or just the sweetness of apples, pears etc and I love it! I bake with yeast at least once a week. The smell of rising dough is one of my favorite things! I bake with yeast nearly once a week ! These look like an amazing recipe! I bake with yeast a couple times a week for our family’s bread. I bake with yeast several times a year. I don’t bake with yeast too often. Only when I’m feeling brave! Usuall 3-4 times a week. I bake with yeast every couple of weeks. Sometimes more. Love to make pizza. Now that I’ve discovered artisan bread in 5, I bake with yeast much more often! So far, once a week! The smell of yeast products baking is better than cologne or the worlds best perfume. These rolls look amazing. Love, just love love love working with yeast dough. I get so much satisfaction from combining, mixing and kneading a mound of dough into a beautiful appetizing, yummy finished product. Make all types of yeast dough, from nut horns all the way to and including croissants. The smell from the product baking…mmmmmmmm,. Hard to wait for it to finish baking and cool off so you can indulge. I use yeast every time I bake bread! Love this recipe! I bake with yeast about once a week, but definitely more in the cold Minnesota winter! I bake with yeast every once in a while at home! Hopefully More in the near future! I use Red Star on a weekly basis, it makes baking easy! Thank you for making it simple. I don’t bake with yeast as often as I used to when I wasn’t working – probably once a month or so, I’l bake up a batch of bread or rolls. Husband makes bread in breadmaker probably every other montyh. While I would like to bake more often, but life happens. However, this time of year I do much more baking as I tend to give breads and rolls as gifts. My friends love my cinnamon rolls, but these sound good! I’ll try them this weekend so my friends can enjoy next week! Whenever I am ready to impress my friends. That often during the holidays. I bake a couple of times a week with Yeast and my favorite is Platinum. I bake with yeast as often as I have time to, which is not as often as I would like! Probably once or twice a month minimum. I dont bake with yeast very often- I would like to start using it more though! We use yeast at least once a week sometimes more!! I will be using your sticky roll recipe for brunch tomorrow. I bake with yeast about once a month not because I don’t want to but as a diabetic, I can Only splurge on HOMEMADE bread about once a month or my A1C would be in Double digits! But around the holidays, I Bake for family & Friends who don’t bake at all. We use yeast, at least, once a week and, frequently, more often. Your brand of yeast is wonderfully consistent! I used to bake with yeast quite often, and I would love to get back into it. This book would give me a lot of inspiration. I bake with yeast several times a month. I use yeast about twice a month for pizza, cinnamon rolls, etc. At least twice a week….sometimes, more often! Love it!! Love their books, own all of them. Love your site and bake from it frequently! It’s to step out from my buttermilk rolls recipe. It’s a good recipe, but it’s time to try something new! My benching skills need upgrading, my ingredient list needs expanding, and I need to acquire some confidence! Some of the above may give me a start…for example, the Hawaiian style rolls. I bake with yeast at least twice a month in the warmer months but more often during the cold months. Nothing smells better when you come in from the cold than to have the wonderful scent of fresh baked bread, rolls or some wondrous sweet creation fill your nostrils with the absolute promise of something yummy waiting for you. My husband bakes bread quite often and that adds to our use of yeast as well. It has been a long time since I baked with yeast. Time to dive back in! not as often as I would like. I LOVE making bread! I work with yeast weekly. Love making our breads! My yeast baking ebbs and flows with the seasons, but I enjoy making whole wheat sandwich bread often. When my daughter comes for Christmas we always bake a braided cheddar loaf and other special goodies! I bake bread every week. Sometimes more often. I am always looking for new bread cookbooks. I make bread every other day. Not just because I love making it (although I do enjoy making it) but also for health reasons. I know what goes into my bread when I make it and I can’t eat store bought because of the additives. I try to work with yeast at least once a month. I bake with yeast every couple of months. About once a week, usually on the weekends. Just found your site and love the bread pictures! I bake with yeast, and this brand of yeast quite frequently. I use yeast at least three times a week, but less often since your dough can stay in the fridge for a few days. My husband loves your pizza dough, and I’m trying to convince him that a REAL outdoor wood fired pizza oven will be beneficial. I have a small propane pizza cooker, but I need the ambiance of wood fired brick! 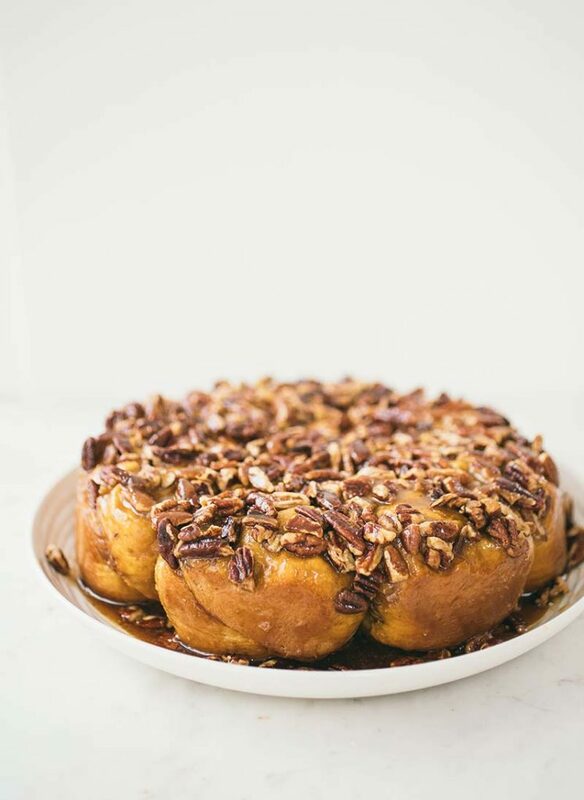 Sticky buns look scrumptous! I bake with yeast once or twice a week and more during the holidays. I usually bake with yeast more around the holidays. I also bake about once a month for birthday celebrations. I try and bake with yeast at least once a month, otherwise, every couple of months. Not too much. My mom and grandmother were champs at baking with yeast. I wish I had their talents. I bake with yeast every weekend!!! Nothing like the smell of fresh baked bread!!! I bake once a week using yeast. A couple times a month…and of course more often at holiday times! I bake with yeast about once a week. I love to bake but my husband isn’t much for bread. I have to wait for the kids. I don’t get to use yeast very often due to lack of time. I’d love to embrace the concept of this book and bake with yeast much more! I love to make breads about once a week, so I use yeast for that but also for pizza dough or cinnamon rolls. I bake with yeast twice a week. I don’t use yeast very often, but I’d like to try baking bread. The pumpkin brioche looks amazing! I bake with yeast every week. I haven’t bought bread in a couple of years. 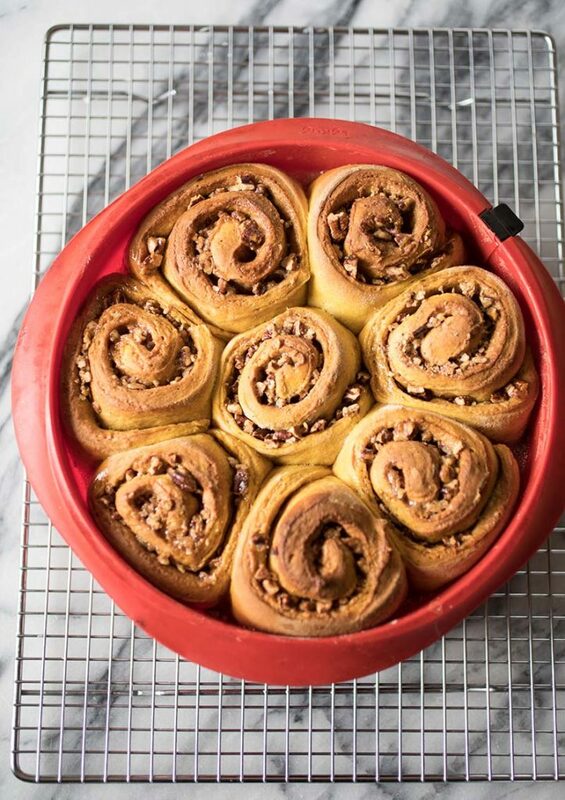 I am going to try these cinnamon rolls soon! Several times a year, mostly for holidays or birthdays. Adding this to my to do list this week. Looks quite delicious. I use yeast at least twice a week. Usually pizza dough, the rolls or bread on the weekends. I use yeast about once a month to make Bread or Rolls… With my work schedule I have little time.. Still remember my grandmother’s Fresh warm loaves of Bread and her Giant Sandwich Rolls.. Yummy..
Not as often as I would like to.Seems all the good recipes use yeast and hopefully soon I will try some of them. Maybe over the Holidays since I have some time off work. All your recipes look delicious. Usually yeast bake once a week but at holiday time it increases to several times a week as my breads are in demand. I am a huge fan of their bread recipes. This is no exception. Cannot wait to get this new book. I bake with yeast several times a month during the fall and winter months. I bake with yeast once per week to make my husband and I our one loaf of bread but I do make sweet breads at Easter and Christmas. I use yeast a few times a week. I usually bake with yeast at least every other week. More during the holidays! I bake at least 4 days a week. The other days, I make homemade tortillas. I use to bake with yeast a couple times a month, now I bake weekly. I bake bread every week. Not very often. Maybe a few times a year. I bake with yeast 2 or 3 times a year. I bake with yeast at least twice a month. I use yeast recipes mainly around the holidays. Sometimes I do make other things throughout the year as I get extra time! That looks amazing! Love the change up to the regular nut roll!! Thank you so much!! 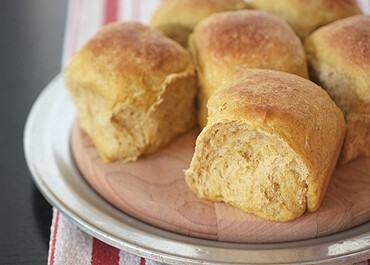 I use Red Star Yeast in the rolls and breads I make weekly. I am known among my family and friends for the wonderful rolls I make. I bake with yeast 2 or 3 times a month and my family loves it! Using my bread machine quite a bit. I need to get comfortable with using combination bread machine and hand kneading and manual rising. I’ve wanted to try pumpkin in rolls. Can’t waite. Weekly or more, most of the time. I make pizza dough at least once a week and bread a few times a month. I usually bake once a week. My greatest joy is teaching my children to bake bread!!! Those sticky buns look divine!!!!!! I don’t use Yeast as much as I would like too. Once a month or two. In the new year, I am hoping to make bread regularly so that will change. I have a neighbor that works at a bakery and she has given me fresh yeast in the past, but I do like to convenience of storing the Red Star Yeast. 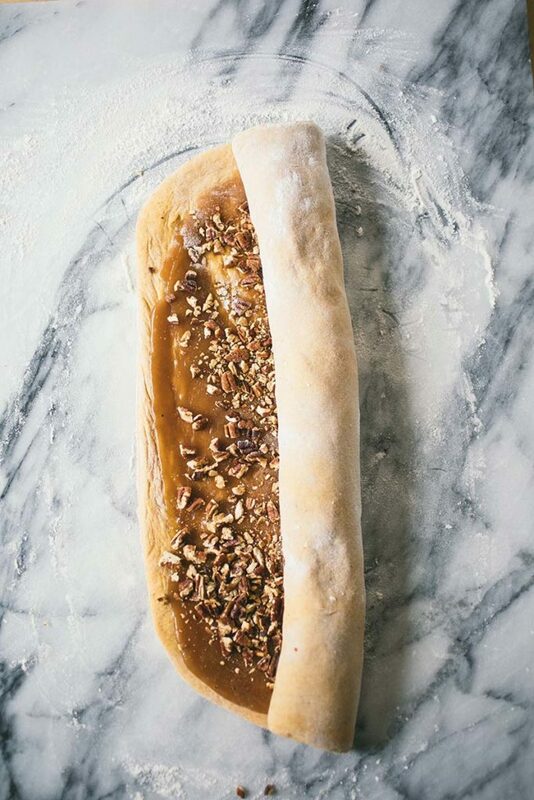 I bake bread at least once a week, and am going to have to try the Pumpkin Sticky Nut Rolls – they look so good!!!!!! I bake with yeast at least once a month. I do use yeast every week to make homemade pizza. I have only begun to bake. I usually try to bake 3 or 4 times a week. I like making dinner rolls, and plan on doing some white loaf bread, and maybe attempting Hawaiian sweet rolls. I usually buy those but it would be nice and cheaper to make them myself. 🙂 Probably taste better too. I want to start making all of our breads. I can control the ingredients. I love to bake with yeast and try to do it at least once a week, even more when the weather is cooler. 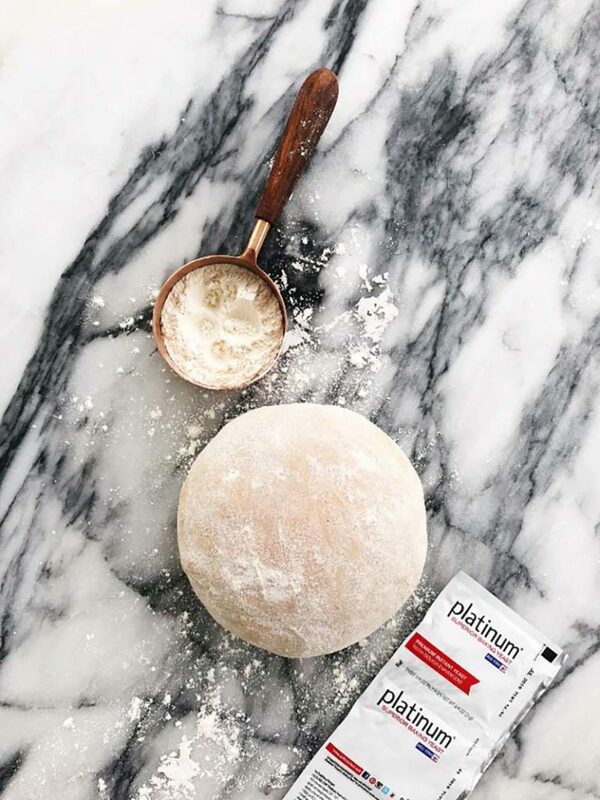 Love homemade pizza dough year round and rolls and breads – and the list goes on! I am an avid baking, thanks to my Grama & great Grama!!!! It’s key to have THE BEST yeast. Fresh ingredients are best. There’s nothing better than a loaf of homemade bread warm from the oven. I bake with yeast usually at least once a week. This time of year, at least twice a week, but overall probably 3x/month! Looking forward to baking cinnamon rolls for family during Christmas time. My hobbies include learning to bake yeast breads since retiring. Sweet success is shared. We bake with yeast now it seems twice per week. I bake with Red Star yeast usually a couple times per month; however, during holidays probably 2x week…gifts for family and friends. I bake bread weekly, my family loves the Hawaiian sweet rolls, cinnamon rolls and honey wheat bread. Love this site and the variety. I leave most of the yeast baking to my husband. He makes most of our bread, pizza(which is very popular with family and friends, here in RI winters and summers in Quebec, and also sweeets. I am just starting out baking with yeast. I have only begun to bake. I try to bake 3 or 4 times a week. I like making dinner rolls, and plan on doing some white loaf bread as well as attempting Hawaiian sweet rolls. I use yeast several times a month for homemade pizza crust for our dinner or when my son stops by he likes me to make him a homemade pizza. I also bake cinnamon rolls often. I always have yeast in my house. I always bake with yeast more in the winter, but about once a week normally. I bake with yeast everyday. I make tons of breads and cakes with yeast every day. I bake with yeast at least twice a week, can’t wait to try this recipe. I bake bread weekly and maybe twice a month, I bake cinnamon rolls. Really like the ref. dinner rolls, the dough is good for up to 3 days. I bake with yeast every week, sometimes more. It is one of my favorite things to do. No one ever turns down a neighborly gift of freshly made yeast breads! Now that we have cooler weather here in California and less chaos I find myself baking once a week or so. Having an empty nest means fewer people to chow down! I’ve introduced my oncology nurse to your website and she is in love!! Many thanks for all your wonderful recipes! I love your yeast!! I make bread at least 3 times a month…. I bake with yeast once or twice a year but am hoping to do it more often in 2019! Love Red Star yeast!!! The only yeast I use to make my homemade breads!! I bake with yeast 4-5 times a month. Yeast baking is one of my favorite kitchen activities to share with grandchildren. The magic of rising bread, the fun of fingers in dough and the delight in eating their own creations – makes great memories and picture opportunities. I love the holiday season. It’s perfect for baking gifts to give away or for special holiday dinners. I have not worked with yeast for a long time ,but I bought some and I am going to try some things. Not very often. I’m still unsure of my baking with yeast skills. I do still have a bread machine but tend to forget to use it! I bake with yeast a couple of times a month. I’m still a newbie, but, bake with yeast around once a month, more during the holidays. I bake bread at least once a week. Everything looks so good & yummy! I always use red star yeast to bake with. Try to at least once a week. I bought your first book and use it all the time. I also love crusty bread and this is my go to book. I will be using my last bit of dough today and will be making a new batch tomorrow. Always have some dough in fridge. Love the way you two met and started something great together. i bake with yeast as often as i can! nothing beats the wonderful smell of baking with yeast! I make grandma’s Swedish rolls! I bake with yeast about once a month. Not as often as I would like to! I bake with yeast at least one time per week. My husband is the bread maker. He uses yeast once a week when he bakes bread from scratch. I so look forward to the Winter holiday season. So many great baking opportunities. I use yeast a few times a year,but want to make my own bread more next year. I bake with yeast 1-2 times a week. If I could eat faster I’d bake more! I bake with yeast about 6 times or more a month! My husband has been doing all the cooking and baking as I can’t right, but we both enjoy eating products made with yeast and baked. The book you are offering looks interesting and I know we will both want to look it over. Thanks for having such a nice give-away. 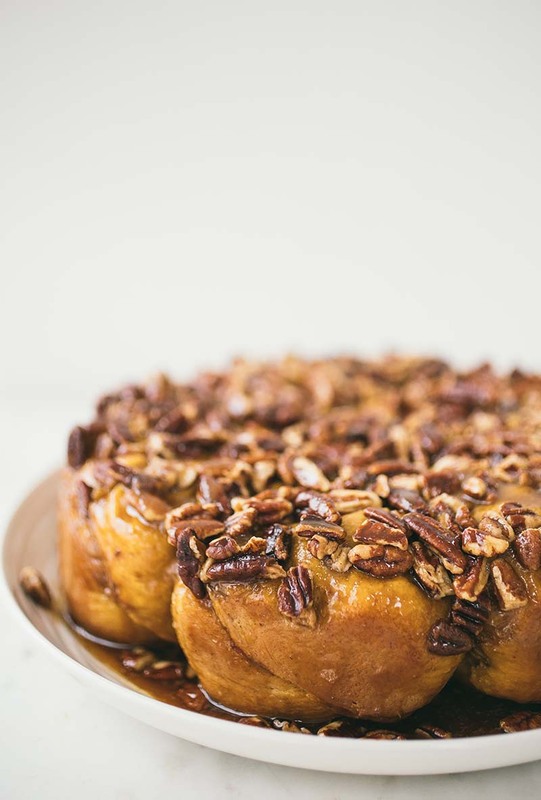 Love the look of these delicious sticky buns. Can’t wait to try them and all your breads if I should win the book. But, I have learned a lot of you on Craftsy. And nothing smells as good as bread baking in the oven. Red Star Platinum is my new favorite yeast for quick rising times. Use it about 2 times per month sometimes more during holiday months. Hoping to use it more when I get good at making sandwich breads. Then I will not have to buy store bought bread anymore. I am a big Jeff and Zoe fan! I prepare a batch of their refrigerator dough every week and make bread and rolls throughout the week. No yeast works as well as Red Star. Probably once a month on average. I’d like to do more but I have problems planning! I use yeast 1+ times a week. I have been making dough since I was bout 8 years old!!! the only yeast I will use is Red Star. I bake with yeast as often as I can though the frequency increases in the cold weather months when we all need as much comfort as possible. These quick recipes are magnificent! I bake with yeast a couple of times a week. Love it. I usually bake with Red Star yeast once a week or more depending on my schedule. Red Star yeast has never let me down! I bake with yeast every 2 weeks. I found Red Star yeast and was so impressed with how well it works. I have been converted. At least once a month or so. Thanks for the chance. I bake some kind of yeast bread weekly, and often do a sweet type of roll once a month. This is one I will definately have to try. I am self taught on baking so I bake with yeast infrequently but perhaps 3-4 times a year. I bake with yeast about once a day, make my rolls. I bake with yeast about once a week. But 52 times a year may be an understatement! I usually bake with yeast about 10 times a year. typically it’s cinnamon rolls. Going to try this sticky roll recipe for Christmas. I bake with yeast at least once a week. I’ve got the dough for this yummy recipe rising right now! I use yeast in baking about twice a week! But with the holidays let’s just a whole lot!! I bake with yeast about 6 times a year. i would love to bake more often, but living in SW Florida, it just gets too warm to have the oven on, when it’s in the 90’s outside. I really enjoy using yeast though. It’s a little cooler now, so I’m planning to bake soon..especially for Christmas. I try to make with yeast once a month. Hopefully when I’m out of school I can bake with yeast more! Fabulous recipe. I love to bake. I’m either using my wild yeast (sourdough) or Red Star yeast. I have good success with Red Star active dry yeast. Nothing like homemade. Maybe once a month, sometimes more, sometimes less. Love yeast breads! I bake with yeast like once a week!!!! I’m obsessed with breads! I bake with yeast all of the time, I make my own pizza dough usually about once a week and then love to make other yeast breads too when I get the chance! I bake with yeast two or three times a year. I’ve asked for this new book for Christmas but just in case… I love baking with yeast and try to do it weekly. I bake with yeast when I’m at work every day, and at home about once a month.